I've heard a lot of buzz about a recipe called "Bang Bang Shrimp." I don't eat shrimp so I didn't pay much attention to it. 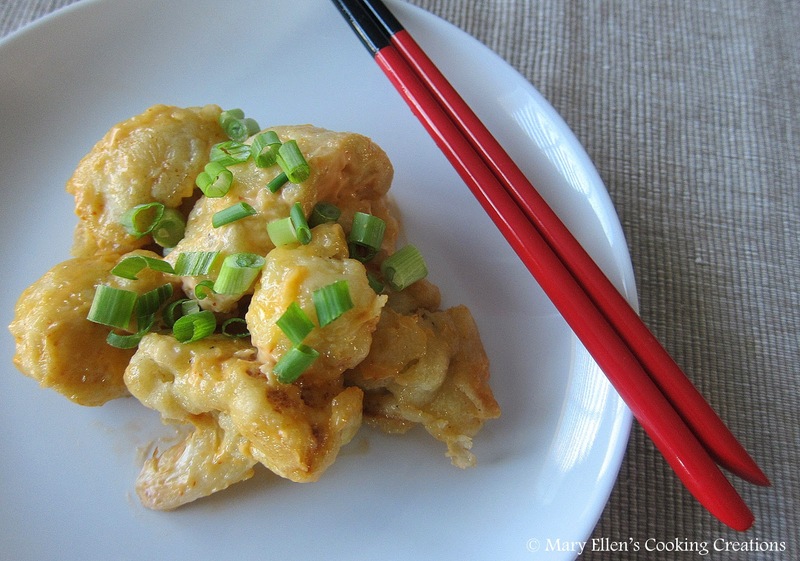 But then while browsing on Pinterest one day, I saw a recipe for Bang Bang Cauliflower on the blog That's So Michelle. I was intrigued, so I took a looked and pinned it with plans to make it. I bought a huge head of cauliflower last week, and decided to give it a try. The recipe on Michelle's blog called for dipping the cauliflower in flour, egg whites, and panko. But I wanted something thicker, more like tempura, so decided to make a batter. I hadn't made a batter before, so used this simple recipe for a tempura batter on Food.com. It was exactly what I wanted - a nice thick and crunchy coating that stuck to the cauliflower and soaked up all the sauce. Between the crispy, crunchy cauliflower and the creamy, spicy sauce, this cauliflower was absolutely amazing. I can't wait to make it again, and plan to try it with chicken and some other veggies, too. Place the egg yolks in a large bowl. Add iced water gradually, blend well. Add the flour all at once and stir briefly so it's all mixed, but still has lumps and clumps. Make this batter as soon as you are ready to start cooking - you don't want it sitting around. 1/2 head of cauliflower cut into florets. Heat oil in a large pan - about 1/4 inch deep. Dip cauliflower into the batter, and then drop it into very hot oil. Cook a few minutes per side until crispy and golden brown. Transfer to a cooling rack or paper towel lined plate to drain. Toss with the sauce and top with green onions. Enjoy! !